Founded in 2004 with the support of the Russian government, the Valdai Discussion Club bills itself as a forum that “aims to promote dialogue of Russian and international intellectual elites.” But the club’s 13th annual gathering, held in Sochi in late October, at times felt more like a shouting match than a measured debate. The widening divide between Russian and Western values was on full display at the meeting. Some of the sharpest exchanges focused on the past, including contentious claims about the consequences of the Soviet Union’s collapse. Throughout the conference, Russian speakers criticized the United States and its Western allies for missing an opportunity to create a stable geopolitical framework for the 21st century by failing to embrace Russia after the Soviet collapse in 1991. In the view of many Russian participants, a stable new pan-European democratic order could have been created, based on principles of mutual respect, equal security, and non-interference in internal affairs. Hearing the views of Russian officials, it was clear old wounds have not healed, and there is a deep desire in Moscow to rectify perceived historical wrongs. 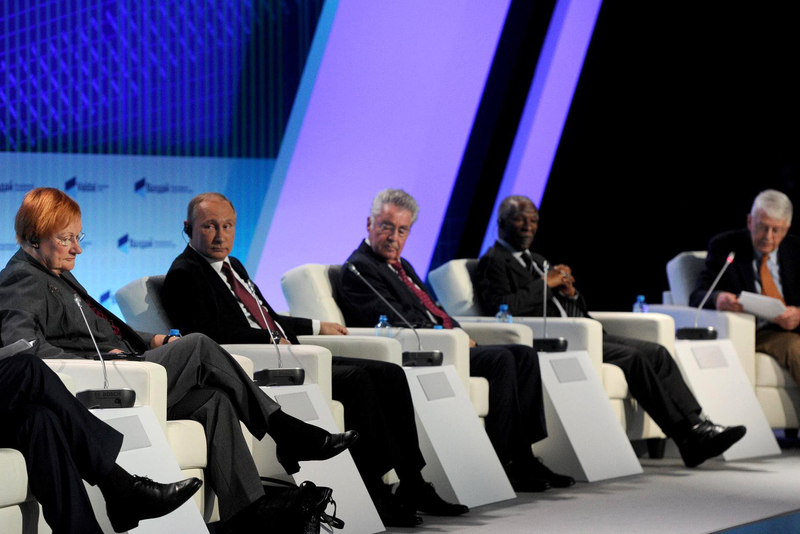 Top Russian officials who spoke at the conference shrouded past slights in aggrieved rhetoric. Foreign Minister Sergei Lavrov, for example, condemned NATO’s membership expansion, claiming that it spoiled any chance for the “establishment of the united and indivisible world." Russia, in the Kremlin’s view, bears no responsibility for the current, frosty state of relations. President Vladimir Putin, who has spoken to the participants of every gathering since the club’s inception, offered a laundry list of the West’s diplomatic blunders that brought on the chill, including NATO’s campaign against Serbia, the allied invasion of Iraq, the intervention in Libya, and the development of US missile defenses. When it came to contemporary dilemmas, it was much the same story: Russia is blameless and the West is acting in an arrogant manner. Syria repeatedly was cited as the litmus test for the state of Russian-Western relations. Lavrov alleged that while Russian diplomats have made many efforts to work directly with Washington regarding Syria, the United States had proven unable, or unwilling, to fulfill pledges to Moscow to separate “moderate” terrorists from more extremist ones. Deputy Foreign Minister Mikhail Bogdanov claimed that the Middle East was in a “systematic, multi-level crisis” due to Western efforts to promote forceful regime change. He also accused the West of advocating the adoption of democratization models unsuited to prevailing “historical, cultural or religious” conditions. Some American participants pushed back against the Russian version of events. Clifford Kupchan, the chairman of the New York-based risk consultancy Eurasia Group, asserted that since early September, Russia had seemingly abandoned a joint approach on Syria in favor of “extreme violence” that included the bombing of hospitals and other civilian targets. While Russian speakers denounced perceived Western-sponsored efforts to promote regime change, many Western participants complained about Moscow’s embrace of so-called hybrid warfare – tactics that are most visible in the Kremlin’s dealings with Ukraine. Several also expressed alarm about Russian meddling in US politics, notably the Kremlin’s alleged support for Donald Trump’s presidential bid. Putin denied that Russia had the ability to influence the US political process and pledged to work with the winner of the November 8 election. Nonetheless, he praised Trump for being a man of the people and accused Democratic nominee Hillary Clinton’s team of inventing stories about Moscow’s supporting the developer-turned-politician. Putin also mockingly voiced a wistful desire “to possess such a propaganda machine here in Russia” that could sway events. In recent years, Russia has made progress in “deconstructing the US-imposed world order” by joining with China to work on Eurasian-focused political and economic projects, such as the Shanghai Cooperation Organization and the Collective Security Treaty Organization, said Russian international relations expert Sergei Karaganov. Not all the Russian participants fully backed the Kremlin line. Ex-finance minister Alexei Kudrin, for example, alluding to Moscow’s deepening economic difficulties, noted that Russians could no longer rely on “old methods and old prescriptions” to deal with the “extraordinary” challenges facing the country.